Do you ever see a recipe online or in a cook book and think that you just have to make it? When I saw a recipe for a green powerhouse pesto plate on Oh She Glows, I rushed to add it to my dinner menu for the week. It included healthy fats like avocado, which I’m trying to eat more of this week. I also didn’t know how I could pass up the opportunity to make this recipe full of green-hued vegetables, when the plated pictures looked so enticing. Of course, it is now one of my many bookmarked recipe websites. The only difference between this one and the others is that I’ve actually made it. As for many of my other foodie bookmarks, I still “intend” to make them (though I’m sure I’d have more than three months of recipes to make even if I made one each day – ah the power of a click of a mouse). In the end, this green powerhouse pesto recipe did not disappoint. It wasn’t one of those recipes that was overly complicated or hard to follow. It was simple and straightforward, like the flavors and textures of each ingredient. While the original recipe called for millet, they had run out of it in the bulk section at Whole Foods. I substituted the millet for quinoa. 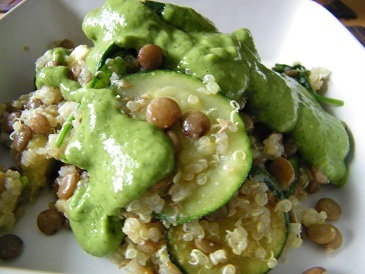 The quinoa added texture and was just as nutrient-dense as millet. I also have to admit that I have totally become a quinoa addict. I now like it more than rice and pasta. It is so versatile because it can be paired with so many different flavor combinations. I make it on a weekly basis because I just can’t get enough of it. It keeps me full and gives me energy at the same time. More quinoa recipes to come. If you have any favorites that include quinoa please feel free to share! I’m not going to post the recipe because Oh She Glows really did a wonderful job of creating this recipe and I followed it almost entirely. The only thing I changed, was that I used the leftover half of the avocado in the quinoa mixture. I diced it and stirred it in. It had a nice soft texture that went well with the quinoa. I also used quinoa instead of millet. Even if you don’t like zucchini (I’m sure you could add your favorite veggies in and it would still be delicious) or green lentils, make the avocado pesto. You will not regret it. It is deliciously creamy and it adds a rich taste to the dish. I’m sure it would be wonderful with a spring or summer pasta dish (maybe with some peas and hearty portobello mushrooms – can you tell I love portobello mushrooms yet too?). All in all this recipe was a keeper!